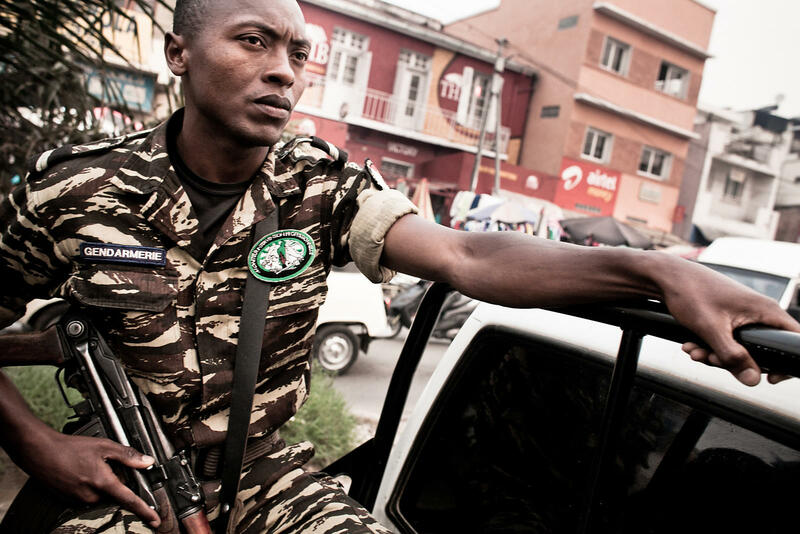 RIJASOLO | A gendarme patrols near a polling station in the Anosy district of Antananarivo on October 24, 2013. Poverty-wracked Madagascar votes on october 25 in long-delayed elections expected to restore democracy and pull the vanilla-rich country out of the rut it sunk into after a 2009 coup. With 33 candidates on the ballot paper and no clear favourite, chances of a first-round winner appear slim, raising the possibility of a run-off in eight weeks' time. Main political players, including strongman Andry Rajoelina and the man he toppled in March 2009, Marc Ravalomanana -- have been barred from the election to avoid their long-running political wrangling from jeopardising the vote. 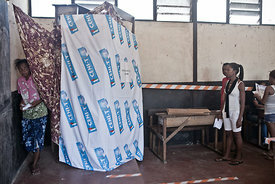 A gendarme patrols near a polling station in the Anosy district of Antananarivo on October 24, 2013. 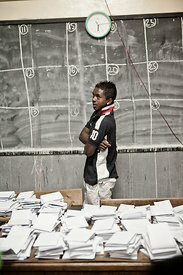 Poverty-wracked Madagascar votes on october 25 in long-delayed elections expected to restore democracy and pull the vanilla-rich country out of the rut it sunk into after a 2009 coup. With 33 candidates on the ballot paper and no clear favourite, chances of a first-round winner appear slim, raising the possibility of a run-off in eight weeks' time. Main political players, including strongman Andry Rajoelina and the man he toppled in March 2009, Marc Ravalomanana -- have been barred from the election to avoid their long-running political wrangling from jeopardising the vote.